Microsoft CEO Steve Ballmer's bonus was cut because of the $900 million Surface writedown. Awful Surface sales forced Microsoft to take a $900 million hit to its earnings -- and CEO Steve Ballmer got a smaller bonus check as a result. Microsoft (MSFT) revealed in a regulatory filing Friday that Ballmer received $550,000, or 79%, of the $700,000 bonus the company targeted for him over the past fiscal year. Despite growing sales across most divisions, Microsoft's board didn't max out Ballmer's bonus because profits from Windows tumbled 18% and the company woefully overestimated how many Surface tablets it would sell. If this story sounds familiar, that's because this isn't the first time Ballmer got a smaller bonus than planned for a big mishap. In fact, pretty much the same thing happened a year ago. Ballmer took home 91% of his target, or $620,000, in fiscal 2012. That's because the company failed to provide a browser choice screen on European PCs running Windows, as required by an 2009 antitrust settlement. Microsoft said it was an inadvertent mistake, but the European Commission fined the company $730 million for the error. Ballmer announced in August that he would retire by the end of next summer. Acknowledging some of Microsoft's mistakes over the past several years, Ballmer says he wants the new CEO to oversee Microsoft's transition to a "devices and services" company. He says Microsoft needs to focus on making hardware, online services and apps that work together seamlessly across multiple screens and gadgets. 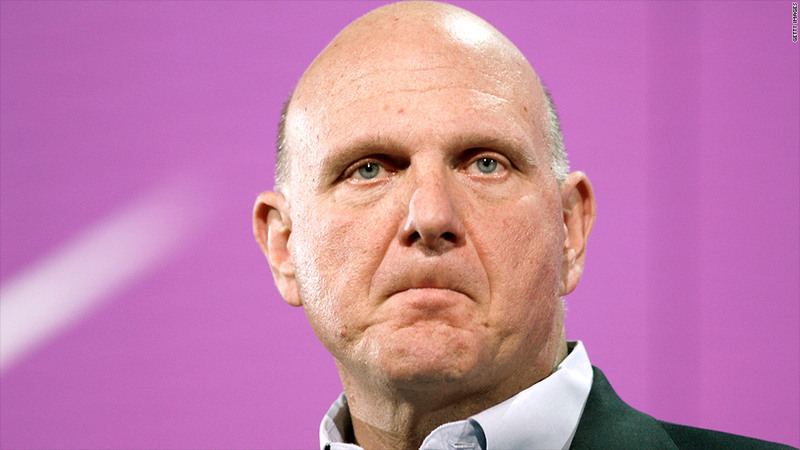 The company has not announced a successor for Ballmer yet. But former Nokia (NOK) CEO Stephen Elop, who will rejoin Microsoft once Microsoft completes its purchase of Nokia's mobile device business, is widely considered to be a top contender for the job. But there have also been several reports suggesting that Microsoft's first choice is current Ford (F) CEO Alan Mulally. And even though Ballmer may be retiring with slightly smaller rewards than he would have expected, $1.17 million in bonus payments over the past two years is hardly chump change. Ballmer, who will not be getting a retirement payout from the company, also owns about 333 million shares of Microsoft. That stake is worth nearly $11.3 billion.